The Auschwitz Institute for Peace and Reconciliation (AIPR) marks the date of December 9, 2016 as the second official International Day of Commemoration and Dignity of the Victims of the Crime of Genocide and of the Prevention of this Crime. The annual International Day was established through Resolution 69/323, which was produced during the Sixty Ninth Session of the UN General Assembly, to coincide with the anniversary of the body’s adoption of the Convention on the Prevention and Punishment of the Crime of Genocide. Decades have passed since the adoption of the Convention on the Prevention and Punishment of the Crime of Genocide on 9 December 1948. Yet we continue to be confronted with extreme acts of violence against individuals and communities simply because of their national, racial, religious or ethnic identity. Member States and the international community must honour the suffering of the victims of genocide, and of their families, by working even harder against expressions of hatred, intolerance, racism and xenophobia. Let us spare no effort to uphold our moral and legal responsibility to protect populations against genocide. Dr. Tibi Galis, AIPR’s Executive Director will be participating in the official observance of the International Day, which will take place at United Nations Headquarters in New York. Dr. Galis will provide remarks on the importance of commemorative initiatives, like the International Day, to civil society’s efforts in assisting governments around the world with the development of effective policies for the prevention of genocide and other mass atrocities. The event, which will be held in the Trusteeship Council Chamber, will also feature contributions by Jan Eliasson, Deputy Secretary-General of the United Nations, Adama Dieng, United Nations Special Adviser on the Prevention of Genocide, representatives of the Permanent Missions of Armenia, Argentina, and Switzerland as well as survivors of the genocides in Rwanda and Srebrenica and interventions by UN Member States. On this year’s International Day of Commemoration and Dignity of the Victims of the Crime of Genocide and of the Prevention of this Crime, the Auschwitz Institute for Peace and Reconciliation joins with the United Nations, national governments, and other organizations around the world to honor the memory of the victims of genocide and other mass atrocities and calls upon all UN Member States to sign and ratify the Convention on the Prevention and Punishment of the Crime of Genocide. 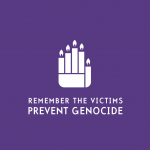 AIPR also recognizes this occasion as an opportunity for the international community to reaffirm its collective responsibility to prevent mass atrocities through durable long-term approaches, in the recognition that genocide is a process and not a singular event.